Our Lady of Victory students joined kids from over 100 metro Atlanta Schools at Infinite Energy Forum earlier this month. “Super Kids-Super Sharing” is a yearly initiative taking place in the city that hosts the Super Bowl with a mission to give to the community. The kids provided books, sports equipment, and more for a total of more than 40,000 donated items. 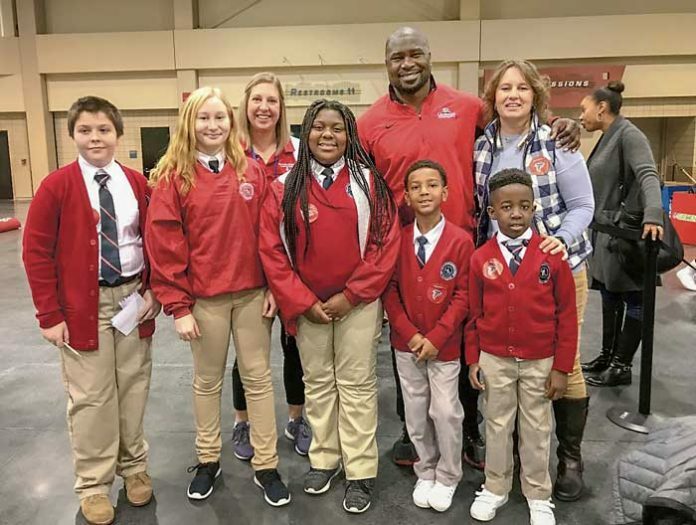 Pictured are: Students – Richard Threlkeld, Melanie Brook, Kenniya Gumbs, Nicolas Glover, and Kofi Boakye; Teachers – Christine Krabel and Lisa Shupenus; and Atlanta Falcon Legend Ovie Mughelli. Photo/Submitted.